Kids outdoor relay games - Come learn and join in the fun! There is nothing quite like kids outdoor relay games. Kids are masterful at playing these games, because their main motive is to have fun and kids outdoor relay games really up the ante! They present personal and group challenges, adventure, discovery, and ultimate fun that can often be so unusual, unique, and appealing that they might not be experienced in any other ways or settings. 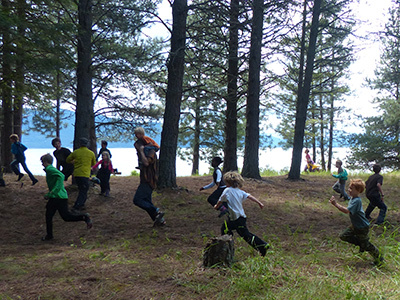 Here I offer you a selection of some of the most fun ones we've played here at Twin Eagles Wilderness School, some of which have been inspired by the ideas of kids. Enjoy! How to Play: This is a classic relay race game where two or more teams are racing to collect as many sticks for their beaver lodge as possible in the time they are given. Have each set of team members spread out along given routes. Each team has a pile of sticks at the beginning of the race, and is racing to move the sticks one at a time to the other end of the relay race. The sticks are passed on from one beaver family member to another and then piled up to make a "lodge." For a competitive spin on the game, the first beaver team to build their lodge wins. For a cooperative spin, when all the lodges are built, everyone wins. This game is really fun because it moves your awareness out in many directions all at once by noticing all the different beavers running around simultaneously. The complexity of stick passing is what creates the true personality of busy beavers and what makes for a lot of fun among the teams. You can get several beavers passing sticks to other beavers to add more complexity. You can end the game by exploring the life of beavers such as what kind of trees beavers eat, learning about their shelters, and more. How to Play: Create two teams. Have each team of people line up spaced out a good distance from each other. The first person in the line has water cupped in their hands. They are to pour the water from their hands into the next person's hands. The water gets passed all the way down the line until it reaches the last person. The goal is to not lose any water which can be very challenging! This is a wonderful game for people of all ages. It's most fun to do while in the water but certainly can be played on land as well. Water is a great sensory element to incorporate into kids outdoor relay games. It also gives people the opportunity to experience and interact with water in a way they might not normally on a daily basis. How to Play: Players are to truly balance well enough that they can walk on their knees. The goal is to walk on your knees an established distance until you reach the next person on your team and then touch them which sets them to go forward and walk on their knees until they reach the next person on their team and so on. The game ends once everyone has walked on their knees a determined distance to the finish line. We have played variations of this relay game many times at Twin Eagles Wilderness School and it gets people laughing hysterically! It can be a very fun challenge to learn how to walk or run on your knees balanced without falling over. Try playing this game in the snow when snow is a shield to the impact of hard ground. People are bundled up and their knees and elbows are protected with cushiony layers. How to Play: In this relay game each member of the team is given a piece of dry cedar bark and a stone tool. When the game begins the first person begins shaving off inner bark from the cedar with the sharp edge of their stone tool. When they have a nice fluffy bundle of it they pass it to the next person on their team. It is then the next person's turn to shave off inner bark until they get a bundle of it, passing it to the next person. The game is complete once a big tinder bundle has been made by all the team members and together they are to light their tinder bundle into flames be it with a match or an ember from a fire or a friction fire method. Be sure that players understand fire safety, and keep a watchful eye. Of the many kids outdoor relay games I know, this one is pretty exhilarating to watch and also participate in! The test of scraping bark quickly and efficiently, the enthusiasm of working together to achieve fire, and the satisfaction of seeing a tinder bundle burst into flame makes for a great medley of fun and learning for everyone. How to Play:Players on each team stand in a line, a circle, or some other formation. One person begins by passing the leaf to the next person who passes it to the next person and so on. The way to make this game interesting is the way in which the leaf is passed. Examples of leaf passing ideas could include passing it through your legs to the next person, passing it around their back, or passing it with eyes closed. If the leaf is ripped or damaged in any way during the passing there could be a penalty of some kind or some action like the team starting over. Interested in more games like these? Check out our other outdoor game articles, Fun Outdoor Games and Great Outdoor Games for Kids. 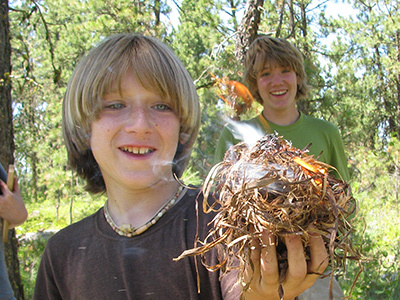 If your kids like these games, they will probably love coming to Twin Eagles Wilderness School Youth Programs or Summer Camps. Check them out and let us know if you'd like more information! Interested in being personally mentored in Nature Based Mentoring, on a transformational journey of connection to nature, community, and self? Return from Kids Outdoor Relay Games to What is Mentoring?